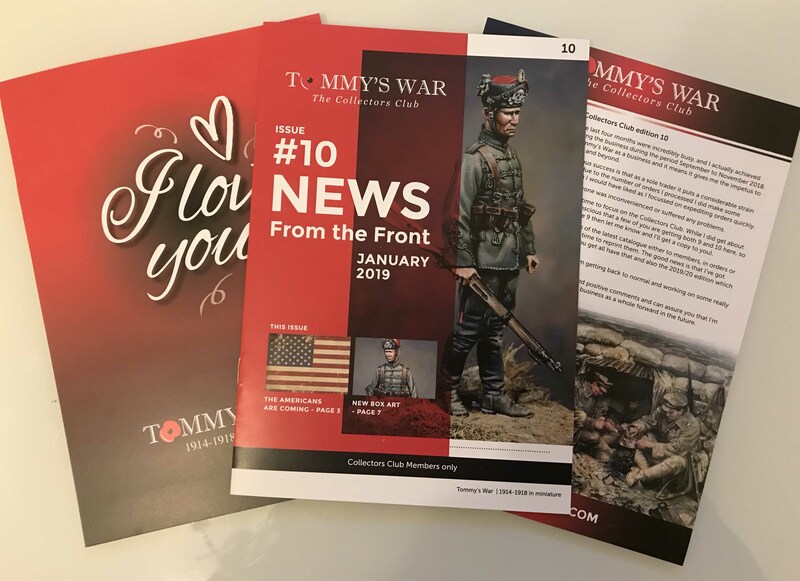 I’m pleased to say that the latest edition of the Tommy’s War Collectors Club (number 10) has been sent out to current members this week. When I set-up the Collectors Club in 2016 I thought getting 100 members would be a high aspiration, so you’ll imagine my delight at sending over 250 copies of edition 11 in the post. I think members will enjoy this edition, it focuses on the year ahead and the figures and equipment I have in the pipeline. This edition focusses on a set of figures that I plan to release in April based on the United States Marine Corps battle at Belleau Wood in the Spring of 1918. There is also one piece of news which will come as a surprise to customers in the form of a new accessory which I hope to release in November. Regular customers will also be pleased to see the return of the £10 voucher, with this current Collectors Club members will be able to use a code to gain a £10 discount on orders over £100 (excluding Collectors Club discount). A customer buys 10 figures x £16.00 each (total price £160.00). A Collectors Club member gets an automatic 20% discount (£32.00) a further £10 discount by using the code and their basket is reduced to £118.00. They then select free shipping and there is no postage charge. That means the customer gets £42.00 discount on that one order. They still get 20% discount on future orders and a Collectors Club Special figure included. That’s a cracking deal! The concept of the Collectors Club was to offer the discount to the people who are most loyal to Tommy’s War. It struck me that at shows customers would ask for a discount on one figure, while my loyalists would buy immediately at full price. That’s clearly unfair, so I changed the business so that it became Direct to Consumer (I don’t sell through other retailers) with an emphasis on the Collectors Club. To be honest, the initial feedback wasn’t great, retailers were unhappy that I wouldn’t sell through their stores and some customers didn’t really understand the benefits of the club and accused me of effectively selling the Collectors Club Special for £25.00. I was called an idiot many times and a moron more than once, so I had some sleepless nights after launching the club. However, over time the Collectors Club has grown year on year and customers see the benefits. Today, over 80% of my business comes through Collectors Club members. Of the 250 newsletters I’ve sent 60% are UK members, 20% rest of the European Union and the last 20% is the rest of the world. This reflects the truly international basis of Tommy’s War and one which gives me a lot of satisfaction. It’s not all plain sailing, running a business on my own as well as working full time has meant I’ve not always been able to spend as much time on the club as I’d have wanted (especially during busy launch periods of new figures) but I’m committed to making the club the best I possibly can.